The following information is designed to help answer some of the questions you might have following your kidney transplant. This information is only a guide. You should discuss any worries or concerns you have with your doctor or transplant nurse. After your transplant, you will need to take medication every day and return to the hospital for regular check ups. Going Home - Going home, after a kidney transplant, is usually a happy and emotional occasion, but this feeling of joy may also be accompanied by a significant level of anxiety for the first few weeks. It is important to realise that recovery following the transplant is a process that can take many weeks or months. For both the patient and their family it can take a while to adjust to the new way of life. Once the vulnerable early period of about three months has passed, most kidney transplant recipients enjoy recovery to a full and active life. 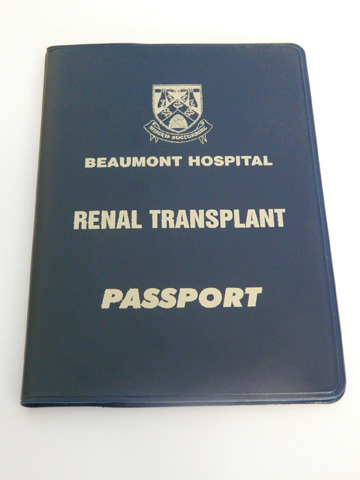 Out Patient Follow Up - Before discharge from hospital, kidney transplant recipients are given a medical diary called a Renal Transplant Passport. It will have all your blood results and any changes made by the doctor to your medication regime. You must bring this book with you to all your visits to the hospital. After discharge, patients from Cork will be followed up at the Cork Renal Unit, whilst all other patients will initially be followed up at Renal Day Care, on Hamilton Ward (3rd Floor), Beaumont Hospital. Before discharge, you will be given an appointment for Renal Day Care. In the beginning, you will attend the hospital once or twice a week. In time, these visits will become less frequent. Once the doctor is happy with your progress, you will be transferred to the outpatient department and may be transferred back to your referring hospital for long-term or ‘shared care’, where you will have regular follow-up with your own nephrologist and medical team. Blood samples taken and tested. Your medications adjusted, if necessary. An opportunity to ask the transplant nurses or doctors any questions. The blood tests are vital to detect any problems, such as rejection or infection, even before you have any physical symptoms. Other blood tests are taken to monitor your drug levels. Renal day care staff will contact the patient the following day regarding blood results and medication changes. For patients attending clinics the ambulatory staff will contact patients only if there is a change in medication, otherwise patients can assume ‘no change’. Psychological Issues - Adjusting to life with a kidney transplant may be challenging for some. Counselling is available, at any time following transplantation, to you or your family should you wish to talk, in confidence, about anything that is worrying you.